Economy Boost for leisure sector Following on from a bumper Easter Holiday period South Lakeland based Pure Leisure Group has announced a further fillip for the region’s Leisure and Tourism economy. The family owned group has commissioned a new range of exclusive Holiday Caravans for new and existing customers. “All our Holiday Parks are seeing an upturn in business as we move out of the recession that has been around in recent years. The sale of Holiday Caravans and Lodges has really taken off, so much so that we have created a new exclusive range – Pure Haven, Pure Retreat, Pure Panorama and Pure Hideaway. Plus the ultimate choice – the Pure Escape with centre lounge arrangement – which is a unique first. The new range has been designed in response to customer feedback so we are giving the customer that special lifestyle choice rather than just a standard Holiday Caravan”. Available to view at Fell End Caravan Park in South Cumbria the new units will also be available at nearby Hall More and Crook O’Lune Caravan Parks as well as 4 other locations further south. Pure Leisure Group is already reporting sales and holiday bookings 18% up year on year and with the popularity of the new Holiday Caravans will continue to make an increased contribution to the buoyant South Lakes economy, plus extra jobs have been created by manufacturers. 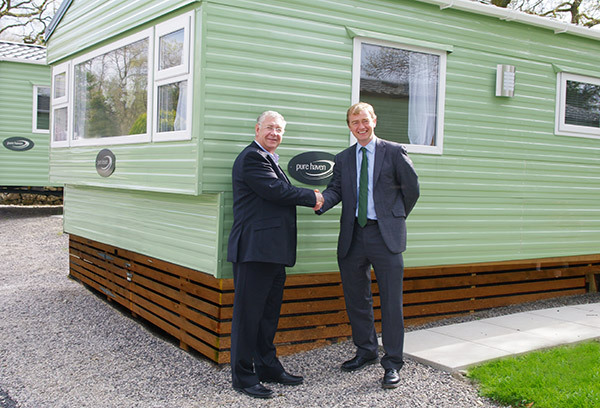 Pure Leisure Group owner John Morphet (left) shows MP Tim Farron a Pure Haven caravan, part of the new and exlcusive Pure Leisure collection, at Fell End Caravan Park.